We offer a variety of reports that are either focused on the individual strengths or the team. Please see in blow tab for more information. 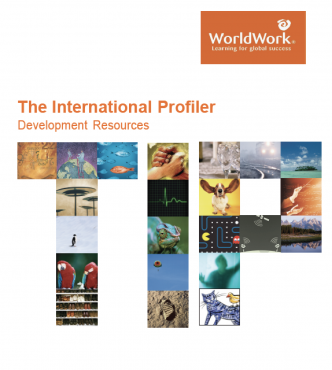 Looking for an integrated development of your personality? 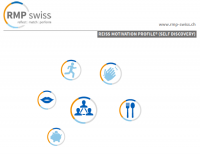 What to get some quick insights how to best shape your path to success? Curious what your soul's path is in this life time? Do you want to actively shape your journey in life irrespective if work or private life? Then access the old wisdom that your hands offer. For ages, hands have been a source of knowledge and discovery for not just palmists, but artists, too. In some cultures, the art of palmistry is embedded into daily life. In our western civilization, though, this art has become disregarded as future telling or daydreaming. But palmistry is a valid study and art of who we are. 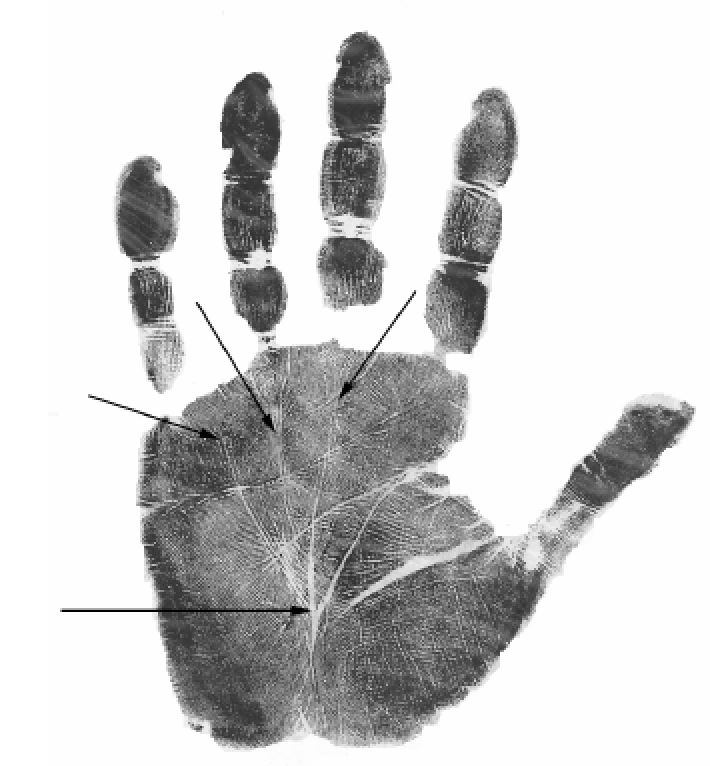 Hand and finger shape, as well as palm lines do reflect your personality. All of the signs of your aspirations, talents, and challenges are literally on the tips of your fingers. In times of change, when one is looking for reasons, answers, or even where to go or who to be in life, hands can be a good compass. They are an easy and accessible guide that are always right in front of you, like a map. As a trained hand analyst, Kathrin M. Wyss decodes your hand characteristics that show what your strengths, challenges and possible ways of development are. In just a short amount of time, you could know your potential areas of growth, and those unrealized desires that have been begging at your heart. The art of palmistry necessitates an open mind, a lot of trust, and a safe environment. Kathrin offers all of this, and more. Book a 60 or 90 min reading - 60 min at $ 180 and 90 minutes at $ 250 - and you get your personalized hand print, information about your soul journey and tips for private and business aspects in your life. Readings can be done also visually using any format of video calling that allow screen sharing. I will explain on your prints where to look for the signs I refer to. 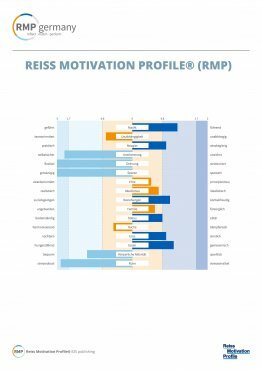 Working with the Reiss Profile sets in motion an intense process of self-reflection, and helps the individual reach a greater degree of self-understanding. People who know their own personality are better able to optimize their performance potential and experience deep satisfaction in their actions and lives. The way they behave is authentic, and their personality coherent and convincing. 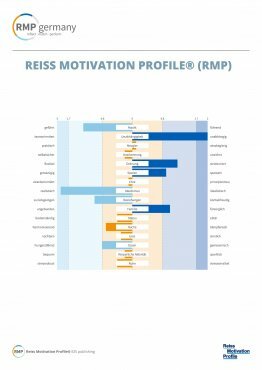 The Reiss Profile shows why other people function in a different way. By understanding people at their roots, conflicts become avoidable and relationships can be put on a sounder footing. Only a few personality tools manage to actually capture the individuality of everyone’s unique personality. The Reiss Profile approach takes the roots of human behavior as its starting point, making our natural tendencies an important tool for both consulting and coaching. 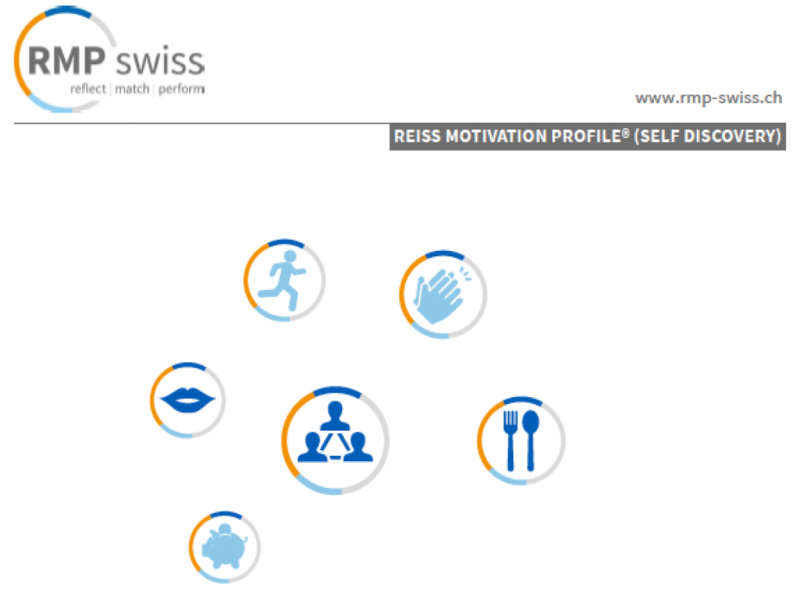 The Reiss Profile is an instrument for measuring human motivation that captures the dimensions of individual personality. It is based on a psychological test methodology developed by Dr. Steven Reiss in the 1990s. 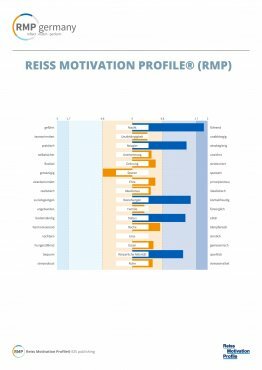 The Reiss Profile is the only personality tool on the market that looks at the underlying reasons of behavior. In other words, it looks at the root causes of human behavior in order to get to the bottom of the fundamental, immutable aspects of individual personality. The Reiss Profile defines a personality profile, which is perhaps as individual as a fingerprint. This means that the indications it offers in respect to individual motivation, values, and likely behavior are extremely precise. This, in turn, is the source of the particular value of the Reiss Profile for consulting and coaching processes. What defines an individual? What makes them unique? Many people ask themselves such existential questions throughout life. Core qualities are a large part of the answer, and the Core Quality Quadrant Model helps to better understand them. Core qualities are attributes that form part of a person’s essence. 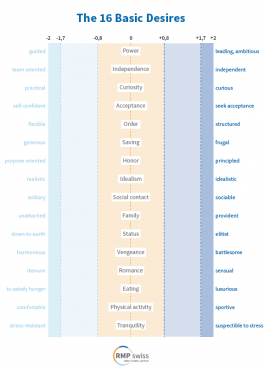 Without their underlying core qualities, an individual would be unrecognizable. These traits are the strengths that come to mind when thinking of an individual. They express the self and generate inspiration. Some examples of core qualities are courage, precision, assertiveness, orderliness, flexibility, etc. The strength of every core quality has a pitfall. When a person’s core quality is expressed excessively, it becomes too much of a good thing, and the quality thus becomes a weakness. An individual possessing assertiveness as a core quality may be seen as pushy if the quality is overdeveloped. Each core quality also comes with a challenge. The challenge is the positive opposite of the pitfall, and a counterbalance for the core quality. In the example of assertiveness, the challenge is patience, as it is a positive opposite to pushiness. Finding a balance between the core quality and the challenge is essential to preventing expression of the pitfall. Just as the core quality can be exhibited in excess, so can the challenge. This is a trait opposite the original core quality, and is called the allergy because people generally react negatively to it when embodied in another person. An excess of patience could become passiveness. Remember that the allergy is the excess of the challenge. Someone who exhibits your allergy possesses an excess of your challenge (a trait you need!). It is essential to have a clear understanding of the Core Quality Quadrant Model in order to adjust work and daily life to best fulfill your needs. Each position in the model needs to interrelate to the other. Each word needs to fit the individual understanding of the person, which results in a few iterations to finalize the quadrants. Working with a certified Core Quality Quadrant Master is recommended to truly get to the source of your personal growth. Trust is the foundation for high performance teams. Teams require people who can expect to depend on each other in working towards a shared goal - and wherever you have interdependence, then trust is the key. 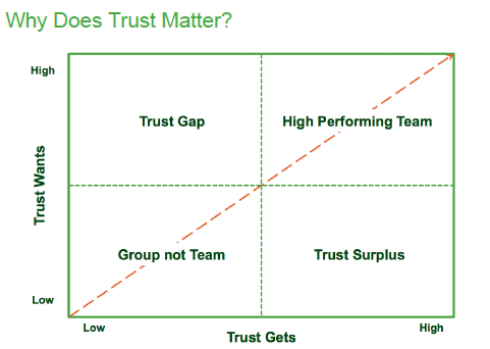 Building higher levels of trust is also the most cost-effective way to boost team performance. For example, no matter how technically brilliant the individuals are in your team, if they have low levels of trust in each other (for whatever reason), research suggests that you have a 50% less chance that they will achieve their shared goals on time compared to a high trust team. This tool will allow you and your team to measure and manage precisely what the team as a whole needs in order to access high performance levels of trust. It provides an X-ray of the most important indicators for team success which will raise performance linked to trust. It will also give you a step-by-step process for working through the key gaps which are holding your team back from achieving more together. It is the quickest and most insightful way to get the whole team to focus on the unique set of factors which can make the difference.